Early betas of Photoshop CS6, an update to Adobe's flagship digital imaging software due next year as part of Creative Suite 6.0 (CS6), show off a darker interface theme, new 3D capabilities, autosave, and a handful of other tool additions, AppleInsider has learned. 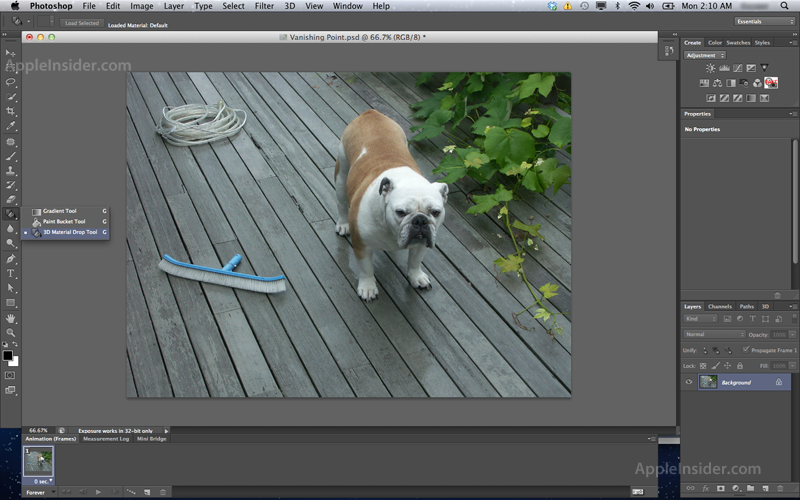 According to people familiar with builds of the software compiled earlier this month, the most immediately-recognizable change to Photoshop in CS6 (version 13.0) is its darker, Aperture-like user interface (below) that replaces the mostly platinum theme found in existing versions of the software. For some, this may be an unwelcome change; that's why Adobe has reportedly —at least in the current beta build —provided testers with the option to revert to the old look. In addition to the color change, the new theme also sports an assortment of spruced-up pallet icons that offer new and slightly different takes on classic designs. The changes aren't so drastic that users won't be able to find their way around, say those who've spent time with the software, but instead aim to 'freshen up' the software's legacy feel. 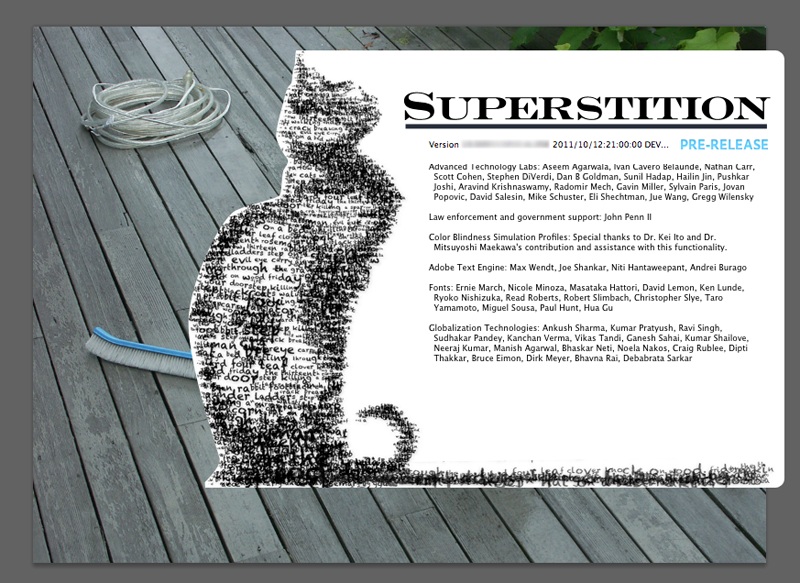 But the real meat of Photoshop CS6, which goes by the code-name "Superstition," appears to be an assortment of new features that Adobe has proposed as enhancements to the software's 3D capabilities that emerged in earnest back with the 2008 release of Photoshop CS4. For example, a new "3D Material Drop" tool has been added to the Paint Bucket, according to people familiar with the software. Similarly, Adobe has also added a "3D Material Eyedropper Tool" to Photoshop's Eyedropper. There's also a new "3D Text" option for text input, rounding out a trio of 3D-centric additions to the Tools palette. 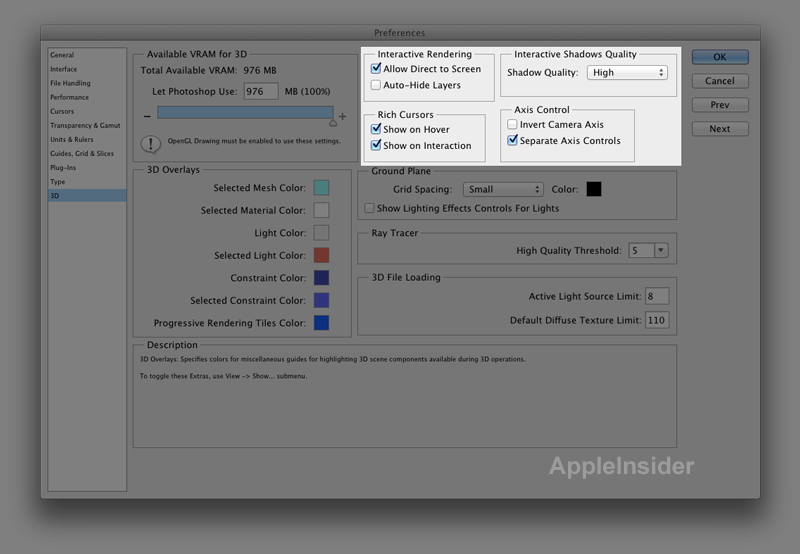 Additional 3D options are reportedly evident in the Preferences pane, where testers can presently enable or disable "Allow Direct to Screen" and "Auto-Hide Layers" options for "Interactive Rendering." There are also new "Rich Cursor" options: "Show on Hover" and "Show on Interaction." Within the 3D preferences, testers can also modify "Axis Control," where options allow for "Invert Camera Axis" and "Separate Axis controls." Finally, a new "interactive Shadows Quality" section allows testers to choose from a range of quality options when generating shadows. 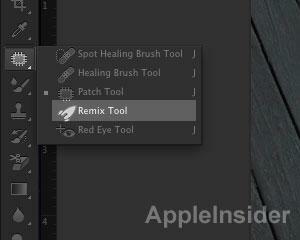 3D tools aside, early betas of Photoshop CS6 also introduced a "Remix Tool" to the healing brushes palette, joining tools such as "Spot Healing Brush," "Healing Brush," "Patch" and "Red Eye" tools. For cropping, Adobe has also added a new "Perspective Crop Tool." 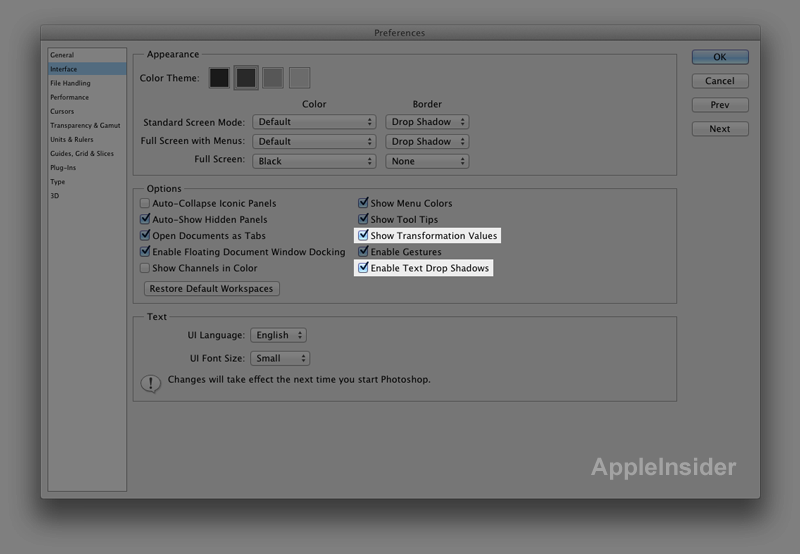 There are also a handful of other changes to the Preferences pane in the new Photoshop. 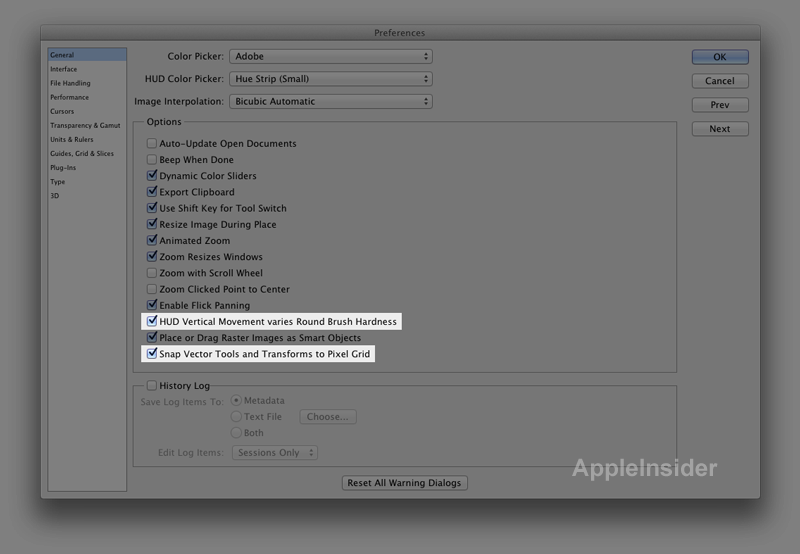 In "General," users can select or deselect "HUD Vertical Movement varies Round Brush Hardness" and "Snap Vector Tools and Transforms to Pixel Grid." Also, under the "Interface" section, new options include "Show Transformation Values" and "Enable Text Drop Shadows." Users can also access new preferences in the "File Handling" section, where "Save in Background" has been added, along with "Automatically save Recovery Information Every:" with a choice of time intervals. 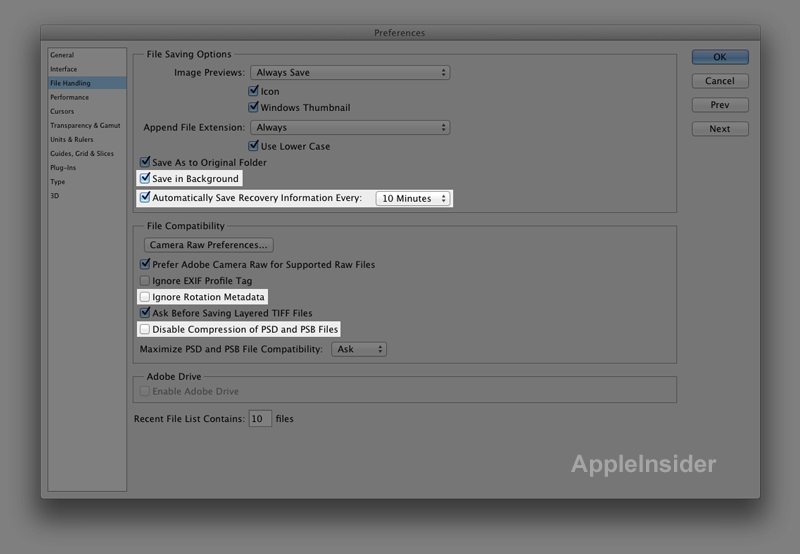 New "File Compatibility" preferences include "Ignore Rotation Metadata" and "Disable Compressions of PSD and PSB Files." 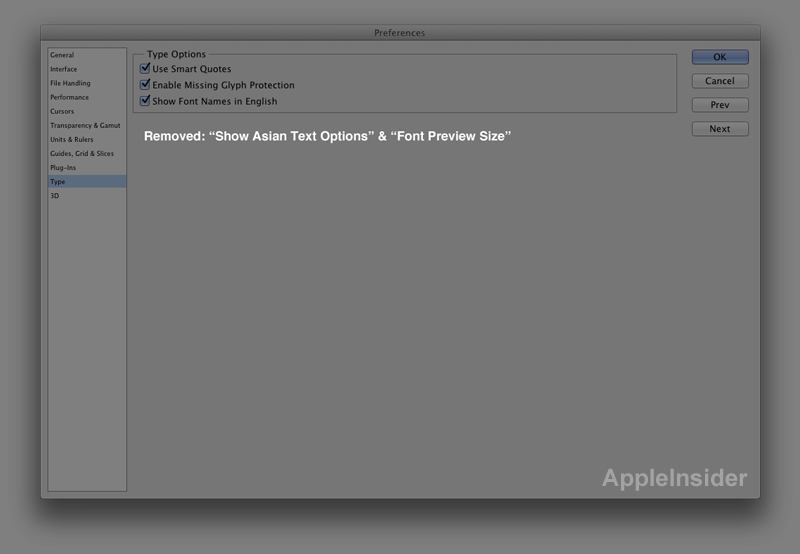 Under the "Type" section of Preferences, a pair of options have been removed in the Photoshop CS6 beta: "Show Asian Text Options" and "Font Preview Size." Given that the information on Photoshop CS6 comes from pre-release test builds of the software, it's probable that some features could be changed, removed, or added by the time the software hits the market. People familiar with the matter say Adobe is shooting for a release of Creative Suite 6.0 sometime around May of 2012. CS6 will mark the first significant update to Photoshop since CS5 back in April of 2010. Although Adobe released Creative Suite 5.5 this past May, it bundled the same version of Photoshop that was included with CS5.